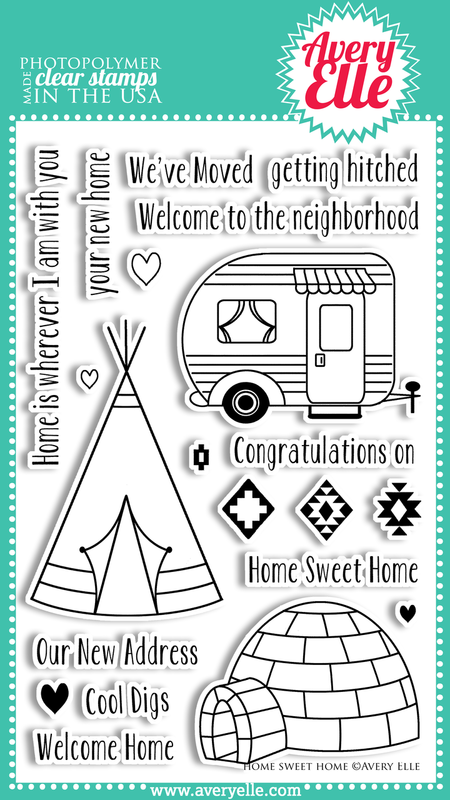 I am sharing a card that I made for my niece and her hubby who just purchased their first home. Such an exciting time for them. Working on my colouring by participating in Kathy Racoosin`s 30 Day Color Challenge. An area I still struggle with is blending my Copics to achieve shading. Adding 2 - 3 tones of the same shade, but the end result ends up looking solid and lacking shading. I persevere and I am having a great time doing it. When I was in Florida we were in Ron Jon`s while the boys were buying shirts I came across this sweet little melamine plate from Natural Life that definitely needed to come home to my craft room. We spent a lot of time while the kids were growing up with a travel trailer touring both Canada and the U.S. so there is some nostalgia there. I used this as inspiration to colour my Avery Elle Home Sweet Home trailer. Here is a photo of the plate I bought beside the card inspired by it. Makes me happy. We actually are at freezing today, I can`t even remember the last time it was that warm. The forecast for the next week ranges from 0 to 6 C still cold but better. I hope that is going to be a trend, it`s time for spring! What a fun card. I love that stamp and the plate that inspired the card is so much fun. I think your coloring looks great. Wow you did such an amazing job mimicking the plate that inspired you. You really made it come to life. The colors you used are so bright and happy!! Love it!! What a cute card for the happy couple!! The plate you found is adorable. I grew up camping too! We always went with my uncle and his family, such good times!! Love this Tracey! The plate is so sweet and your card turned out lovely!!! awww...super sweet! congrats to your niece and her hubby! I think your Copic coloring is beautiful, Tracey! I love how you fashioned your image from the plate...such fun colors with your crisp, clean design! Love the stitched mat, too! Darling card, Tracey - your niece is going to love this! Look at that plate! I even see your darling pooch! Oh, this is so cute Tracey. Love the colorful RV... the plate is so pretty. Great inspiration piece. That is one cute camper!!! What a fun set. Your niece will love it. What a great card! Super coloring! 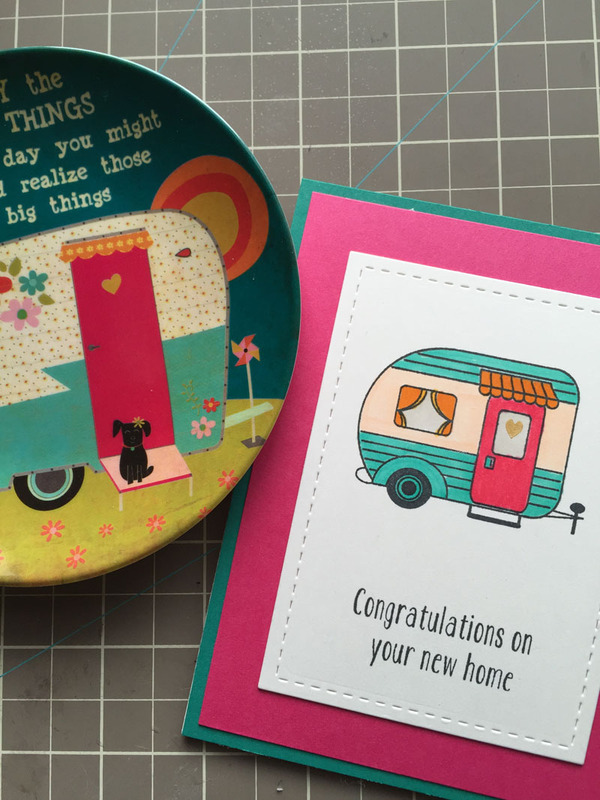 so cute.. i love that trailer..
What a cute plate and just adorable card! I love that little camper trailer!! Cute as can be Tracey! Bright and happy card!! Loooove the color combo!!! 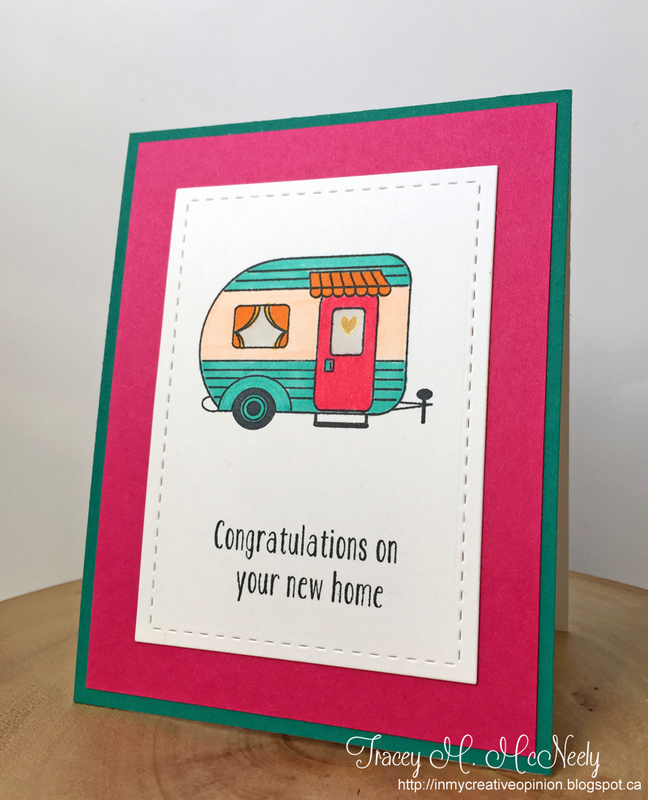 Loving all the colorful layers and how well they coordinate with the colored camper! This is a darling card, Tracey and I love that a plate was your inspiration. Too bad I don't have this stamp to make a card for my grandson who just bought a new home. 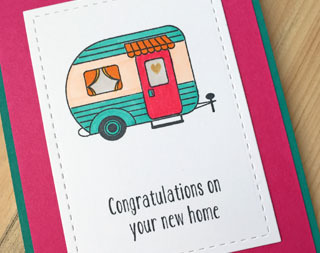 Very sweet new home card. And, how fun that you found an inspirational plate. That card with that plate, the most perfect housewarming gift ever! LOVE! ach what a sweet HOME with this caravan..love your image and your coloring...did you really colored in 30 days..woooww I cant join cause I colored sometimes only at Sunday or Saturday LOL..
have a great Tuesday Tracey..
you know i love this one....and that plate!! This is so lovely!! I would never have thought of using that for a new home card. I like your inspiration piece for the colors. So fun and fresh. Such a beautiful card. That plate is so cute and the perfect inspiration for your card. I'd love a trailer in such fun colours! Tracey, this is just too darn cute. I would love to have one just like it to use as my playhouse for crafting. Really sweet card. Your little trailer is adorable! We traveled extensively throughout Canada and the US when I was a kid (my dad was a geodetic surveyor at the time), but wound up in tents. No trailers for us! To this day, the thought of camping gives me the willies...but if we had a trailer...hmmm! Maybe I'd change my mind, especially if it was as sweet as the one you've coloured (perfectly, I might add) here. Sweetness! Your melamine plate: awesome! Your post has me mega-smiling! I don't know how to add the "jump to comment" link; a project for tomorrow!